Are there any other views of these pictures??? so we can see that they are indeed real? Sorry no more pictures… acctually if you look closer, you can notice some ends aren’t touching, eventhough it appears they are. For example last pictures dark green side has a single 2D square bumping out…. it can’t be part of a blue hole. I see what you meen vurdlak. You mean that the block actually has a blue hole, but there’s a green tab added to make us think otherwise? why is there a watch nxt 2 all of them? doy! i know the trick in this. 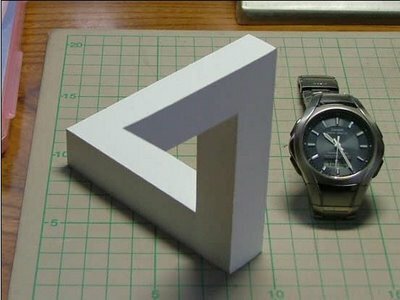 the object is cut and set up in a certain way and the camera only takes the picture in a specific angle or else that would give away the trick. Even if some of you figured it out, it’s still amazingly clever the way it was set up! I couldn’t do it, and I’m sure it took a lot or work. Hats off to you Vurdlak! It’s INCREDIBLE work!!! It is easy to explain.in most of the pictures the structures are not joined but they are arranged and photograph at such an angle that they seem jointed. 2-D green square flap has been added to arrangement. Kay this is kind of off-topic but whats the deal with the watch on the side? Did they think it was easy to keep the secret? They could have used Photoshop and SKETCHED the things! The watches are to show scale. I THINK ?? The triangle is actually an equilateral triangle waih 1 leg perpendicular to the ground. This becomes obvious if you put it in front of a mirror. 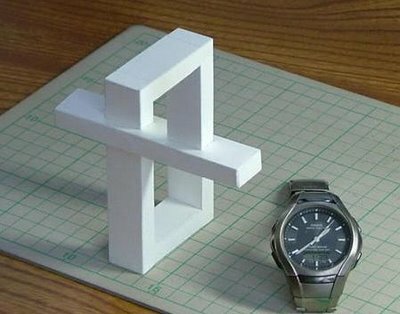 Go to impossible-objects-in-real-life 2 and look at the 2nd one!!!!!!!!!!!!!!!!!!!!!!!!!! Still, why the wath next to every one?!?! FOr all you photoshop illusions are fakers, just becuz u dont knwo how he did it doesnt mean he just made it fake. I could do this myself in one hour per picture. 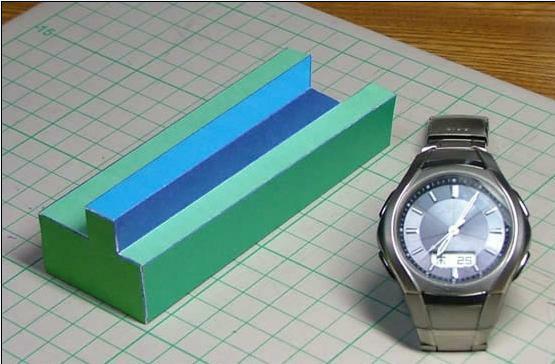 They are simply “Escherish” 2D images added as a layer to the background of the paper & watch. All lighting effects can then be simply added in the Blending Options palette. jeromax, your “illusion” is fake, i can make that, just arrange sticks in that order. Unity triangle is easy, one sie is behind the others. I have a book that illustrates these figures and shows you how they work. It sais “its impossible to build these things no matter how feasible they seem to appear in real life”. Although the watch is there to show scale, it serves a more “shady” even sinister purpose. 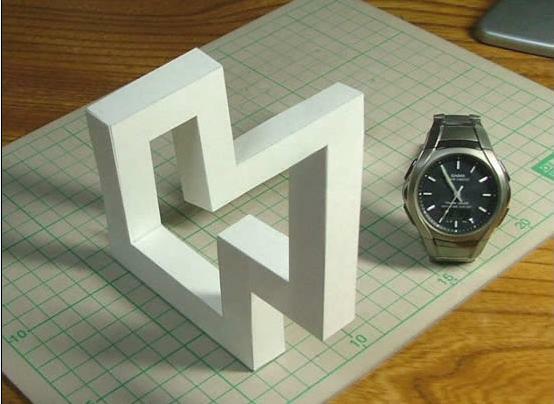 Just as they did with cut out shapes, they did with the watch. an illusion only brought to account by the placement of the “optical” device. In this case the audience, and although it’s easier to change the time on the watch, it’s harder to do the math. bring out a pen and paper!!! maybe a calculator. Hi Vurdlak, thanks for the site. I’m one of the fans too. Keep going and I appreciate your site having well orgnization and catagorization of the illusions much too. click on the photos of the objects to load a Java 3D model and you can rotate them and you will immediately understand the trick behind. there’s pdf file you can print and make the model yourself. they are all just optical tricks. Aaahhh, they make me feel kind of ill xD And in the last one, it’s like impossible to look at both ends at the same time, for me at least. The last 1 iz fake cuz there iz a tab on the side to make u think that its impossible. I can do the fourth one. Look closer. The blue looks like a bench, and I solved the other stuff. The third one is possible. I saw it at the museum near San Diego, where I live. I can’t remember the museum name, but there’s a special park near by. what’s the watch for anyway? £llza is right, the watch is kinda stupid. these are all about the camera angle. look at the shadows, notice they dont touch. its an optical illusion. the mind doesnt know what its seeing, so it fills in the pieces. its like when you look at the inside of a plastic halloween mask, the eyes seem to follow you but they really dont move. its all camera angles. Honestly, all those people who just write comments to say “oh boo hoo, that’s not real, its just an illusion” should wake up and look around. Then MAYBE they’d see that THIS IS AN OPTICAL ILLUSIONS WEBSITE!!!! And no, the models are NOT photoshopped, and they are NOT flat paper pictures. They are all real objects, but the pictures have to be taken from exactly the right angle to make them seem possible. There are some revealing photos of that triangle on this site somewhere, but sorry I dont remember where… anyway if you find it youll see the trick. seriously, cant you find something better to do than try to prove everything is photoshopped? Thank you, Far Out… Baffled and argumentative after looking at an optical illusion… And these are tomorrow’s leaders? I’m fearful. Anyone Else Looking At The Shadows? The 3rd isn’t EVEN A TRIANGLE! Vurdlak, this is amazing :D Whoever did it is awesome, but what is with the watch? I don’t get what is with the watch. Mazz, the watch is there so people can see the object’s size compared to a real wrist watch. Simple. The watch function is only comparison of the shadow shape. MS PAINT ARE YOU FOR REAL PEOPLE BARELY USE THAT ANY MORE!!!! It is all in the angle. Great angles! Seems almost like they are real! Did u make the models urself? I like the blurred photoshopped edges on the third one. I’m putting this as my website (click on my name) just incase the link doesn’t work. These are possible to build in lego. With the right camera angle. why are r watches in practically the same place in every picture?? My eyes went all bendy !!! But what is the watch for? You can build the second one, I think!